MARK NANCE/Sun-Gazette Muncy shortstop Alex Maioranati fields the throw as Montgomery’s Kalen Guyer is safe on a double with an RBI in the fourth inning at Muncy on Wednesday. MUNCY — Brayden Strouse knows how precious every high school sports moment can be. Last fall a shoulder injury nearly ended his final scholastic football campaign. So when the pressure is high and the margin for error low, Strouse does not worry. These are the fun times. These are moments he cherishes. And Wednesday at Muncy he again owned those moments. Strouse entered with the tying runs on base in the fifth inning and struck out the side. He stranded two more runners in the seventh, again striking out the side, and his dominant three-inning, no-hit save helped Montgomery earn a hard-fought 4-1 win against Muncy. Strouse struck out nine, recorded his second save in three days and twice shut down the heart of Muncy’s order with strikeouts as Montgomery (4-0, 4-0 Mid-Penn) remained undefeated. He and Trevor Miller combined on a four-hitter with Miller earning the win and both pitchers leaving 10 runners on base. Last October, Strouse led a last-minute, game-winning drive as Montgomery edged Muncy and captured the Old Shoe Trophy in football for the first time since 2004. The roles were reversed this time as Strouse played closer, but the result was the same. Strouse again shined brightest late when Muncy seemed poised to seize control and win. Tyler Shadle’s RBI grounder and Kalen Guyer’s fourth-inning RBI double broke a tie and gave Montgomery a 3-1 lead. Muncy (1-2, 0-2) threatened in the fifth when Grady Oden and Tanner Gold were hit by a pitch and walked, respectively. Montgomery coach Ross Drick then called upon Strouse to face Muncy’s Nos. 3-5 hitters. A pitcher who has not allowed a hit in seven innings this season showed no fear despite the situation. Strouse overpowered the next three batters, striking out the side on 14 pitches. The left-hander repeated the strikout hat trick in the sixth and only one ball was fouled off those first two innings. The first two Muncy batters reached on errors and advanced to second and third with no outs in the seventh, but Strouse dialed it up again. It was almost exclusively heat as Strouse relied on his fastball and ended his outing the way he started it, striking out three dangerous hitters. Muncy coach Chris Persing was fairly happy afterward as well. Although disappointed they did not win, the Indians fought hard on a day they dressed only nine players and showed why they could be dangerous as the season progresses. Muncy has been ravaged by early-season injuries but hung tough with a District 4 Class A title contender as Max Rymsza threw six strong innings and the defense played flawless baseball. The Indians tied the game 1-1 in the third inning when Coty Steele (2 for 4) hit a one-out double and scored on Donovan Diehl’s single and ensuing error. They had several chances to take a lead and/or tie the game after Montgomery went up 3-1, but hit 1 for 11 with runners in scoring position. Of course, Shadle making several outstanding running catches in left field played a role in that and the situational hitting is something that likely will improve as Muncy receives more game experience. That goes double considering how Montgomery opened the game. Hunter Budman hit a leadoff single, stole second and scored when Strouse scorched an RBI double into the left-center field gap. Rymsza then picked off a runner, retired the next two hitters and settled in. The sophomore surrendered just four more hits over the next five innings and retired eight straight at one point. He also received a lift from his defense with freshman first baseman Cody Duchman leaping high and robbing Guyer of a potential second-inning double. Shortstop Grady Oden made the game’s best play when he sprinted into foul territory in shallow left field, dove face-first and maintained possession of a spectacular catch as he rolled over and closed out the sixth inning. Kevin Wettlaufer helped Montgomery get going in the top of the seventh, drawing a pinch-hit, leadoff walk. 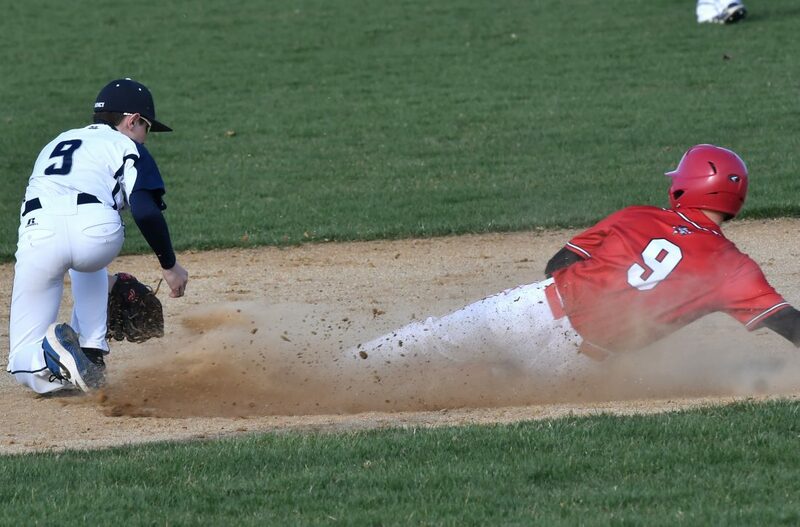 He then stole second and reached third on a Guyer grounder. Vaughan Ault scored him when he belted a two-out RBI single as Montgomery went up, 4-1. That sequence loomed large in the seventh when Muncy’s first two batters reached. Rymsza threw well and Muncy gave Montgomery a battle, but the Raiders did not buckle and delivered at crucial times. Trevor Miller, Brayden Strouse (5) and Vaughan Ault. Max Rymsza, Grady Oden (7) and Tanner Gold. W: Miller, (1-0). L: Rymsza, (0-2). S: Strouse, (2). Top Montgomery hitters: Strouse 1-3, 2B, RBI; Kalen Guyer 1-3, 2B, RBI; Miller 1-3, 2B; Hunter Budman 1-4, SB, R; Tyler Shadle RBI; Rhyle Strausbaugh 1-2, SB. Top Muncy hitters: Coty Steele 2-4, 2B, R; Gold 1-3, BB; Donovan Diehl 1-3, BB. Records: Montgomery (4-0, 4-0 Mid-Penn), Muncy (1-2, 0-2).